You have conquered the impossible. Distancing yourself from the outside world, you buckled down, turned the music up, and took the day to finally clean your place. Goodbye pile of laundry that nearly touched the ceiling! Au revoir moldy Chinese takeout from a month ago! Farewell weird stain of unknown liquid on the rug! Basking in the sweet, sweet glory of your accomplishment, you fall back on your couch with a satisfied grunt, put your hands behind your head and your feet upon the coffee table (sans cup rings), and contemplate what to do after your productive day. Maybe you’ll actually have people over now that you’re not embarrassed of the condition of your home! Maybe you’ll just plug a movie in while looking around, taking in the new cleanliness. You deserve it, right? While we commend you on finding the motivation to clean, are you positive the job is done? Sure the place looks immaculate while taking a quick, sweeping glance, but what about when you start looking into the nooks and crannies? Don’t worry, we’re not judging, commercial & residential cleaning is our forte and through years of experience we’ve learned a thing or two. 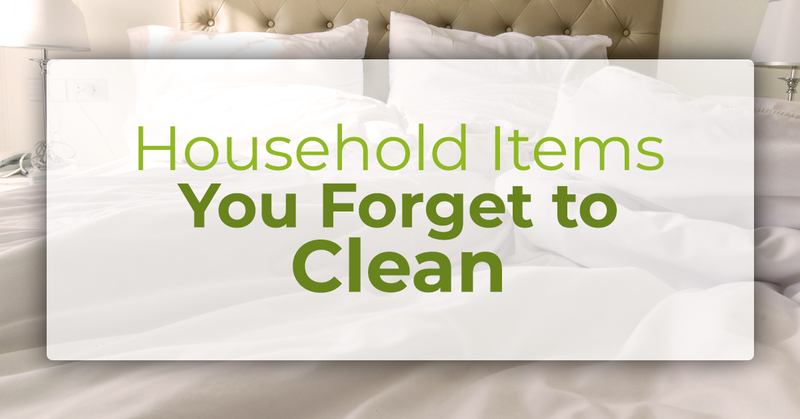 We know that people often forget to clean some of the very things that we use or see most throughout the day. Don’t fret, we know the forgotten areas and items that collect dust and germs and we’re here to give you some guidance on where to look. Unless you’re rolling around on the ground with your four-legged fur baby or searching for your lucky penny, it’s unlikely that you take the time to inspect your baseboards. But the fact is, these frequently overlooked areas can get pretty dusty and grimy in a very short amount of time. Just pull your couch out from against the wall and run your finger along the top… see what we mean? The good news is that these areas are super easy to clean, especially if you do it every couple weeks or so. All you will need is a bucket of warm water, a couple drops of dishwashing liquid or soap, and a microfiber cloth. Use the soapy water to dampen the cloth, and go around your place wiping down the neglected baseboards. While it doesn’t seem like much, you’ll notice a difference as soon as you’re done. Especially during the winter months when your fan doesn’t see much action, it can be easy to forget dusting the top of the b lades. Come springtime, with a flick of the switch, it’ll look like it’s snowing dust bunnies in your home. This can be embarrassing if you have a guest over or just frustrating knowing that you’ll have to spend the time sweeping or vacuuming up the months of collected dust and hair. To save yourself from this unnecessary irritation, be sure to use a duster to clean the blades of your fans during their time of inactivity. You don’t have to do this every day, just enough to prevent build up. Remote control, clicker, channel changer… it doesn’t matter what you call it, what matters is the last time you wiped it down. Used daily and passed from person to person, the remote collects a lot of germs in time and can become a risk of spreading sickness. Take a few seconds every week to remove the batteries, use a cotton swab lightly dampened in soapy water for the areas around the buttons, and finish it off by wiping the rest down with an antibacterial wipe. Voila! No more germ sharing. Just like the remote, the door knobs in your home are used every single day. Whether it’s you, your friends, the creepy neighbor that feels comfortable walking through your place at odd hours, or the nose of your dog when he wants to let you know he’s got to go, door knobs are a hub for germs. Luckily this is also a quick fix. It doesn’t matter if you use antibacterial wipes or a dampened microfiber cloth, take the time to wipe down your door knobs. Your health will thank us. Think your shower curtain is clean just because it is constantly splattered with soapy water? Wrong. Mildew stains and soap scum makes your shower curtain their home after spending all that time in a damp, warm room. Cleaning it is quick and simple. In fact, a majority of the time will just be spent taking it off of those pesky shower curtain hooks. After that, just throw it in your laundry. Bing, bang, boom… clean shower curtain. You know you should be washing your sheets and bed cover (at least we really, really hope you know to do that) but when was the last time you threw your pillows into the wash? A lot of people have the misconception that you can’t wash your pillows, that something will go wrong, or that you’re all set because you wash your pillowcases. Gross. Think about all the drool, sweat, dust mites, and dust mite droppings that have covered your pillow over time. The good news is, almost all pillows with synthetic filling are able to be washed in the washing machine on delicate with hot water. Just check the tag on the pillow for specific instructions and stop resting your head on a pillow of filth! We hope that you don’t seem overwhelmed by these simple but forgotten cleaning tasks, but if you are, or just don’t want to clean at all, leave it to the professionals at UMG Cleaning! We pride ourselves in giving residents and business owners the best and most thorough residential and commercial cleaning services in Manhattan and surrounding areas. Be sure to contact us today to learn more about our eco-friendly cleaning services or to book us for your home or place of business. We look forward to hearing from you!